Only 40 tickets are available the peanut-free area in recognition of Food Allergy Awareness Month. SOUTH BEND, IN - A day at Four Winds Field should be a fun, exciting experience, but that may be a challenge if you have a peanut allergy. 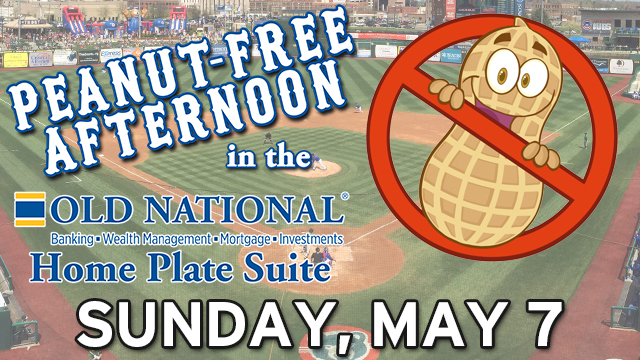 On Sunday, May 7, the South Bend Cubs will offer a peanut-free area in the Old National Bank Home Plate Suite to coincide with Food Allergy Awareness Month. Food Allergy Awareness Month helps educate the public about food allergies, a potentially life-threatening medical condition. An estimated 15 million Americans suffer from food allergies, according to Food Allergy Research & Education (FARE). Peanut allergies are among the most common food allergies and according to studies funded by FARE, the number of U.S. children with peanut allergies more than tripled between 1997 and 2008. "There are quite a few baseball fans that do not get to experience a day at the ballpark due to their peanut allergy," said Team President Joe Hart. "In order to provide a sterile, peanut free environment, our staff follows a strict cleaning process that removes all allergens from the Old National Bank Home Plate Suite to ensure our fans with peanut allergies can enjoy the game." Tickets are only $19.00 and include a seat in the peanut-free Old National Bank Home Plate Suite, South Bend Cubs hat, and a ballpark buffet of hot dogs, hamburgers, chips and soft drinks. Space is extremely limited with only 40 tickets available. To order, visit the South Bend Cubs Box Office at Four Winds Field or call (574) 235-9988. The South Bend Cubs are the Class A minor league affiliate of the World Series Champion Chicago Cubs. Over the past 29 seasons, the team has won five Midwest League titles, most recently in 2005, and has captured 12 division titles. In 2015, the team was named Ballpark Digest's Team of the Year and received the John H. Johnson President's Award, the highest award in minor league baseball. The team is owned and operated by Swing-Batter-Swing, LLC whose sole shareholder is Andrew T. Berlin of Chicago, Ill.